Pimp My System has been a great way for brewers of all different kinds of backgrounds and experiences to show off their creations to the homebrewing world. Well this week on Pimp My System we are fortunate enough to check out Wayne Waananen’s single tier brew frame system with a diverter panel. We found his posting on the AHA forum and decided we had to show this one to everyone. 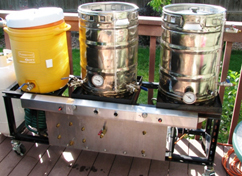 Wayne, a Colorado local, was no novice brewer when he built up this beautiful rig. Having started homebrewing in the ’80s and brewed professionally since then, Wayne returned to homebrewing two years ago after working in electronics. His inspiration for this amazing home-brew system came from his work on Specific Mechanical systems while working at a brewpub. 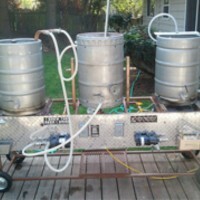 Wayne’s rig is set up so the brewing water comes into the frame through a rated hose and an in-line water filter. 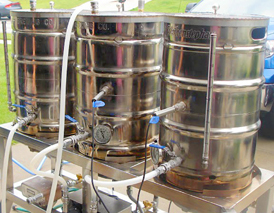 From there he can attach a hose to the valve in the center of the panel and use filter water to fill the vessels, prime the pumps, or push the end of the wort through the counter-flow-chiller (CFC). Wayne’s sleek set-up then runs out of the kettle and in through one of the pumps into a CFC. 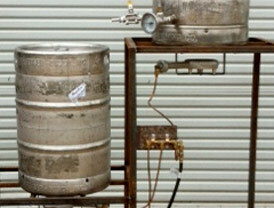 Lastly, he has used a Gott cooler as a mash/lauter tun with an old Phil’s Phalse bottom in it. Hidden from view behind the front panel are two March 809 pumps. To complement this feature, he has set up the camlock to quick disconnects in order to allow him to move liquid from one place to another very easily. All the hoses are 1/2” silicone, and Wayne has recently put together an inline 02 system with temp monitoring. It’s hard to believe that while Wayne has been using this system for only a year, he has completed over 30 batches through it. Truly an accomplishment we all wish we could say. Party on Wayne, you’ve got a great set-up here. 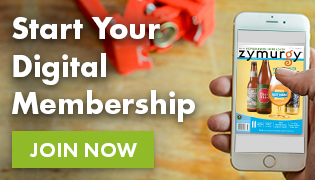 I think we are all inspired to do a little building of our own after checking your system out. Thanks for sharing!